let me congratulate you on winning the election and becoming President-elect of the United States of America. 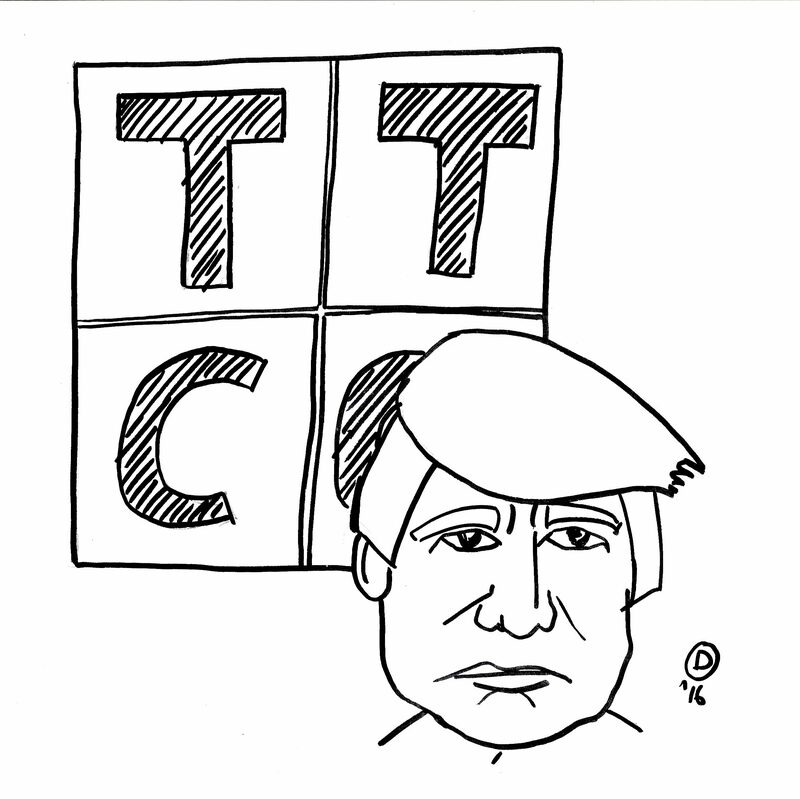 For the last three months I have been drawing one cartoon a day to highlight the reasons why I think you are a bad choice for the highest office in the land (they are all posted here at www.thetrumpcartoonchallenge.com). Some of these cartoons have been below the belt but most were not. They are heartfelt and have expressed genuine concerns. With this letter I want to tell you of my reasons for pursuing this project. The initial concern arose from your public persona. 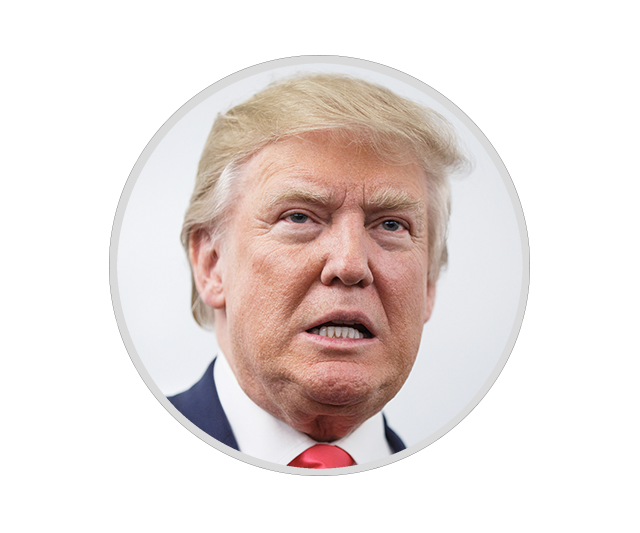 My first Trump encounter consisted of a visit to your Tower in midtown Manhattan. The amount of gold and marble is impressive, as is the prominence of your name over the entrance. These are manifestations of great wealth but it is not the wealth that concerns me. It is what this particular display of wealth is pointing to. It points to a person that is concerned, above all, about one thing: himself. Your towers, your planes, your golf courses, and the women in your life seem like monuments to yourself. You seemed to look at the presidency as the biggest monument of them all. No amount of gold and marble compares to a place in the proud lineage that started with Washington. It looked like the Presidency was for you the ultimate trophy. Unlike a trophy, though, the presidency is nothing to take home and put on a mantle piece to be proudly displayed at dinner parties. By casting their votes for you, millions of Americans have said that they want you to change their lives for the better. They entrusted you with their freedoms, their prosperity, their future. Fundamentally, the presidency is not about you at all. It is about the Americans that have voted for you and about those that have not. It is about this world that depends on you to make the right decisions. I wish you had shown more clearly that your focus can be on other people and not just on yourself. You love to talk about your vast knowledge. When talking about ISIS you claimed to know more than the Generals, yet, when in one of the debates, you tried to explain your position on the situation in Syria you could not articulate a single sensible sentence. Not only did you not know more than the Generals you did not seem to know the first thing about the situation beyond mere buzzwords. It is true that professionals, i.e. people like me, can be too enamoured of their knowledge at times. We are prone to exhibiting intellectual inertia that lets us miss developments that are happening right under our noses. But it is also true that many of the problems we are facing defy simple solutions and it is knowledge that allows us to make correct decision. Your casual relationship with the truth worries me. It is still a little early to understand exactly who voted for you but one story has emerged. The decline of traditional industries like coal and steel has devastated communities from Minnesota to Pennsylvania. Secure jobs in these industries had made it possible for millions of Americans to participate in the American dream. The disappearance of these jobs ushered in an era of joblessness, drug abuse, and declining life expectancy. This process has been going on for a while but the people that were affected by it had no voice that would speak for them. Both Republicans and Democrats often differed very little when it came to economic policy and the death of unions further aggravated the situation of the American middle class. A vote for Clinton would have been a vote to continue with a policy that had nothing to offer to ameliorate the situation. Then, you came along. You correctly perceived this discontent. You realised that something was going very wrong and many Americans saw you as a way out. What will you do to help these people that have voted for you? How will you provide the much needed jobs? You ave not been very detailed in your policy proposals yet but you did mention three topics: infrastructure investments, tax cuts, and tariffs. In a low interest environment infrastructure investment is an imminently sensible thing to do. They are also sensible because America’s infrastructure is in desperate need of an upgrade. Roads, bridges, and airports need to be brought into the 21st century. It will be interesting to watch how your party will react to these proposals. For ideological reasons, members of your party have often rejected federal infrastructure projects. One such person is your friend New Jersey Governor Chris Christie. I hope that you will manage to change your party’s mind on this topic. One proposal of yours that is not likely to have a positive impact on the lives of the people that voted for you is the proposal to further lower the taxes for the higher income brackets. The likely impact of this will be even more inequality. The additional increase of the savings rate will also put pressure on interest rates and is likely to produce asset bubbles. This might look like a solution to the problem but it is likely to be short term and it just postpones the reckoning. It will be interesting to see if you can fight the party’s orthodoxy. I hope you’ll try. I also hope that you’ll take on the carried interest loophole. It is profoundly unfair that some of the highest earners in America have the smallest tax burden in relative terms. Your party is adamantly opposed to any move in this direction. Maybe a political outsider like yourself can achieve what so many insiders could not. The one topic where you can really cause serious damage is world trade. By imposing one-sided tariffs on imported goods you are likely to start trade wars that will bring an end to free trade. You might say that this is exactly what you want because free trade has had such negative consequences for America’s workers. I do hope that you carefully consider your position here. When trade is done well it is able to lift all boats. Trade is not a zero sum game. It is true that jobs have disappeared from the United States but it is also true that trade has created a new middle class in places like China that provides a huge new market for American products. Shutting down trade impedes access to this market. It will also make imported products more expensive. Instead of attacking trade you could work to increase the pay and improve the working conditions of foreign workers. This way, trade can be a path to prosperity for all. American or not. In your personal encounters with debt you were often successful in renegotiating your debt burden with your creditors. At times you mentioned that this might also be a way forward for the United States. The imposition of haircuts on treasury bonds might be one of the most dangerous ideas you have had. We have seen what happened when the housing bubble burst and the loans that were underlying many complex financial instruments turned out to be worthless. The effect of revaluing US debt would be many times larger. Large numbers of margin calls would result in deteriorating asset prices which in turn would result in further margin calls etc. At some point the government would be forced to step in and assume most of the liabilities. If you were unsure how much debt there was in the economy this would be a great way to find out because you will move it all onto the federal balance sheet. Do not try this. As a German I have enjoyed the most peaceful time Europe has ever seen. As a German I was also constantly reminded how lucky I was. Just over one hundred kilometres to the East lived Germans just like me that were not that lucky. Forced to live behind the iron curtain these Germans were denied the freedoms that I enjoyed. This situation remained because of the credible threat that NATO posed. An attack on Germany would have unleashed the wrath of the biggest and strongest military alliance the world has ever seen. So nobody tried. It is this background that makes me cringe at the comments you have made concerning your willingness to stand up for some of the smaller member states. You must understand that appearances play a crucial role here. The moment you make it appear that NATO’s defensive stand is not absolute anymore, you weaken the alliance. You are inviting a potential adversary to try NATO’s resolve at a potentially horrendous price. NATO has provided Europe with security for over sixty years. The recent developments in Eastern Europe have shown that NATO still has a role to play. If anything, its importance is only increasing. To question America’s backing now is grossly negligent. One topic that has received no attention during this election is climate change. This is a stunning neglect because it is arguably the most important issue of all. Taxation, trade, and foreign policy are of no importance if our planet becomes uninhabitable. You claim that climate change is a giant hoax perpetrated by some foreign power to weaken the United States. I implore you to reconsider your position. Talk to people that have studied this topic. Look at the effects that climate change has already had. Consider what might happen if we stay the course. Climate change is important and it does deserve your full attention. A future that is not based on fossil fuels can also be seen as an opportunity. Switching to renewable energy sources is no small feat but it is a way to create a large number of new jobs. You count among your supporters people that have a very dark view of the world. They understand the world as the consequence of the actions of people and organisations that are forever hidden just under the surface. No real proof of their existence is ever forthcoming but they feel that no other explanation exists for the state the world finds itself in. You are now in a unique position. You can in effect see for yourself, first hand, which of these claims are true. You get to have a close look behind the curtain. Will you tell us what you see? I think, on the contrary, that the US is a country where few important secrets remain secret for long. This has always been true but the large scale intrusion into email accounts of people in power makes harder still to keep a secret. A thing to remember during your time in office. A low point of your election campaign was the publication of the conversation you had with Billy Bush in 2005. What you dismissed as locker room talk struck a nerve. For too many women sexual assault is still an all too common occurrence. After the tape appeared, millions of women used social media to talk about their experiences. Follow Kelly Oxford on Twitter and you will get an idea of what I am talking about. In the last decades a lot of progress has been made. In fact, most Americans thought that a woman was the best choice for President. Progress indeed. But it appears that more needs to be done. That a person that openly bragged about sexually assaulting women is now the next President is a jarring state of affairs. It seems to say that the sexual assaults these women have experienced are now officially sanctioned and it is their fault for complaining about it. If you are serious about changing this perception you need to do better than portraying your comments as mere locker room talk. Suing the women that came forward to talk about their experiences with you will not help either. Before you decided to run for President you perpetuated the falsehood that in New Jersey thousands of muslims celebrated the attacks on the World Trade Centre and the Pentagon on September 11th, 2001. You never rescinded those remarks. Instead, you doubled down and proposed an outright ban on muslims entering the United States. You even stooped so low as to attack the parents of a fallen soldier who had expressed their concern about your wholesale denigration of their religion. You seem to be convinced that there is a fundamental clash between American values and the muslim faith. The truth is of course exactly the opposite. The freedom of religion is one of those core American values. If you can not see how one can be an American and a Muslim at the same time you might wan to invite Ali Soufan to the White House. Ali Soufan is the former FBI agent who was in charge of the investigation of the bombing of the U.S.S. Cole. For him, being a Muslim and being an American was not a contradiction. In fact, the US was stronger for having this Muslim as a its citizen. He could also tell you about the effectiveness of torture. While the CIA’s torture program has had a dismal record he did actually obtain valuable intelligence from terrorist suspects. America is not just important economically but it has also always served as a guiding light and an example to follow. Its constitution, conceived 240 years ago, has served as the blueprint for countries the world over. America is not just any nation. When America’s guiding light dims, the world is worse off for it. Your decisions will now determine how bright America shines. Clasping Madison’s No. 10 I wish you success. I hope that the impressions that I have of you are as mistaken as my certainty that you would not become the next president of the United States of America. At a perilous time you have been entrusted with a great responsibility. Problems that require careful consideration are awaiting you. Please, do not take these tasks lightly. I’ll keep a close watch. As will many others. P.S. : Please follow me at infinitecuriosity.eu.